Despite living within walking distance of about 5 places where I can get tacos, I almost always prefer to take the 10 minute drive down to Washington Blvd. in Arlington, when I get a hankering for tacos. I’ve been countless times and I’ve only ever gotten one thing. Tacos. If I lived within walking distance, I’d gladly jump around the menu, but since it’s only every couple of months that I end up going here, I really only want one thing. Tacos. For me, these are the prototype for a taco. So simple and pure. 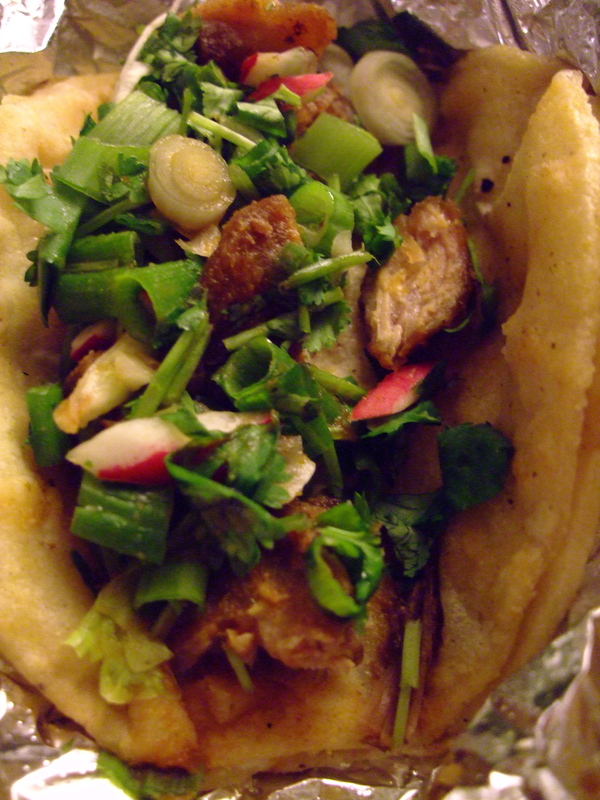 Two warm soft corn tortillas, a modest amount of meat filling, radish and scallion, and some salsa verde. No cheese. No crispy shell (not that I don’t love a crunchy taco.) No lettuce or tomato. No nonsense. When I make tacos at home, this is what I’m trying to approximate. 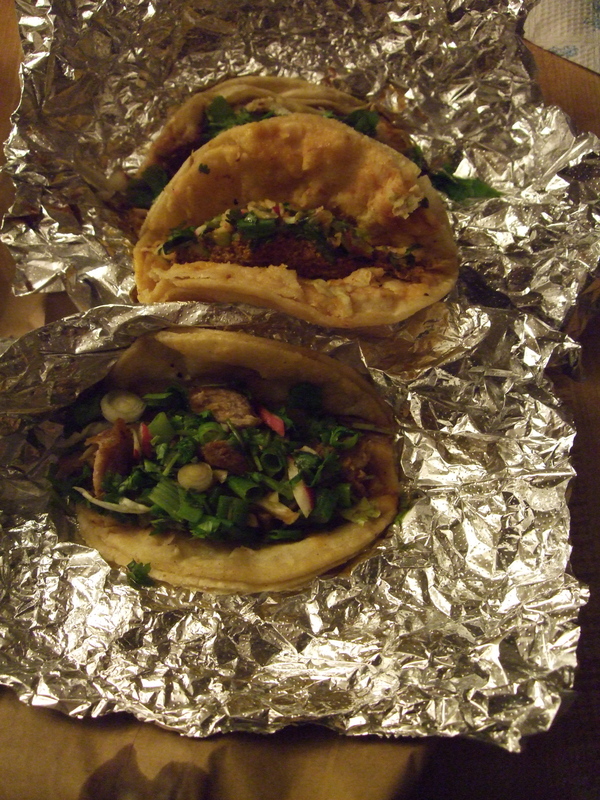 They offer a variety of fillings — pork, beef, chorizo, chicken, beef tongue, and goat. My usual order is a trio of goat, pork, and chorizo. And since this has become somewhat of an addiction/habit, I end up eating them in that order every single time. 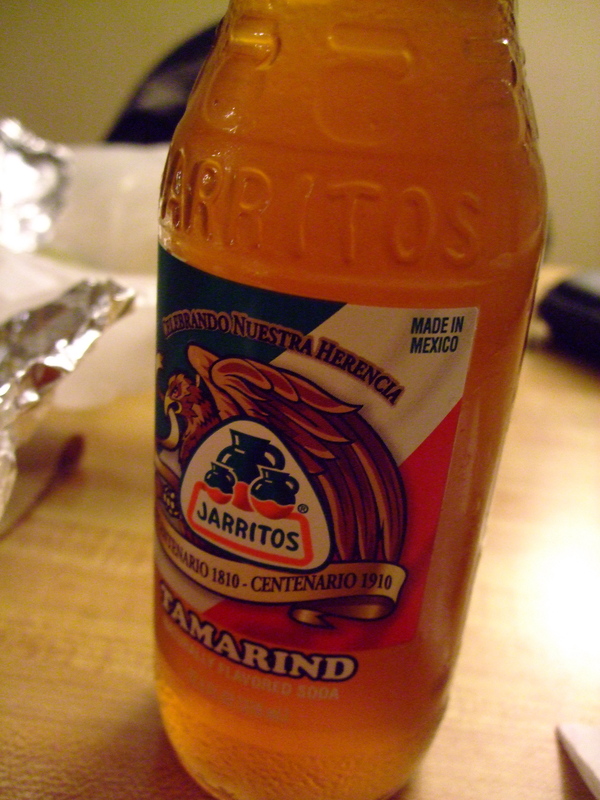 And wash it all down with a tamarind Jarritos. At $2 a taco and $1 for the soda, the bill runs $7, tax included. The goat is slow-cooked and shredded. It’s not the least bit gamy, and occasionally a little greasy. Think shredded beef or lamb. The pork is similarly slow-cooked, probably shoulder, but the pieces are cubed, so they’re a little more substantial. Think carnitas. Lastly, the chorizo, my favorite (which is why I save it for last) is minced and, kind of greasy, but in the best possible way; the grease tasting of the spicy sausage. As bad as it sounds, think about the tacos you had at your school cafeteria texture-wise. I swear that’s a good thing. Each of these little guys are dressed with a simple radish and scallion salad and then a little of the spicy salsa verde. If I were ever challenged to some sort of eating competition, I would pick these. I’m pretty sure I could a thousand of them. Whenever anyone suggests tacos, this is immediately where my mind goes. These warm little rolls of simplicity and tastiness. I love this place, too, and usually go with goat tacos. The burritos are very good, as well, and a bit easier to eat if you are on your way somewhere, and don’t have time to sit, so you are going to eat in the car (because who can wait until they get to their destination?) I have tried the pupusas, which are like pupusas anywhere, and the Salvadoran chicken sandwich, which I only had once.